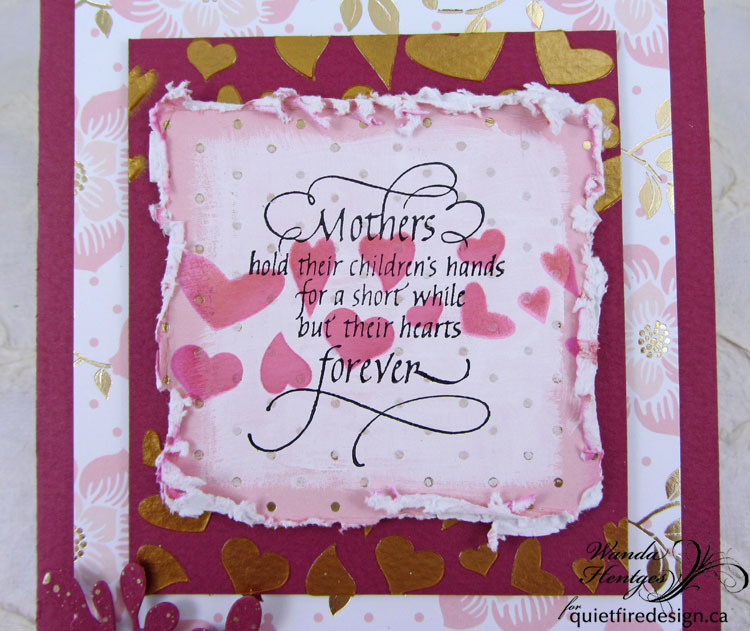 Hello, Connie Nichol here today with a quick card featuring the Quietfire Design stamp 'You may not be able to leave your children'. 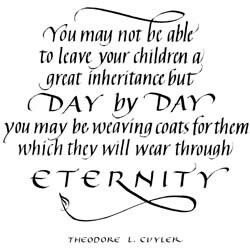 Such a beautiful quote, and so very true. 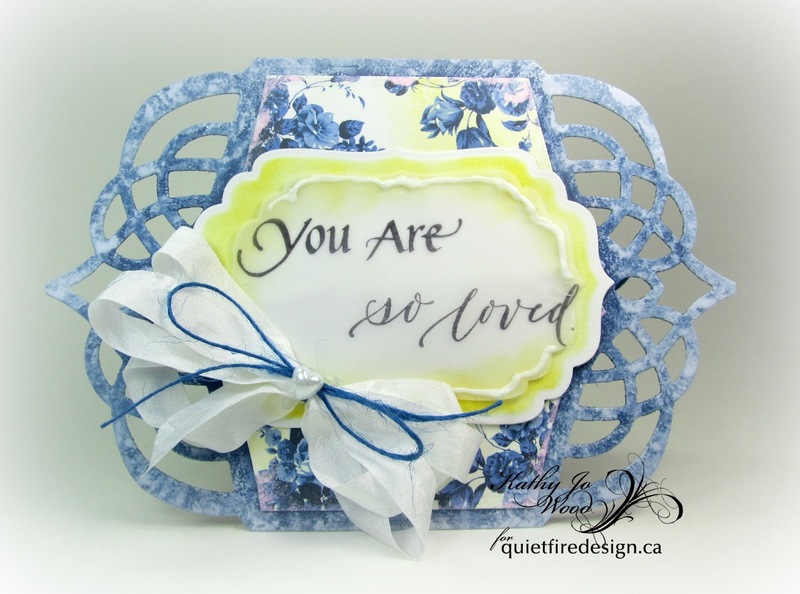 I was messing around with paper doilies and altering them with different colouring media when I discovered they can make a very quick and pretty card background. 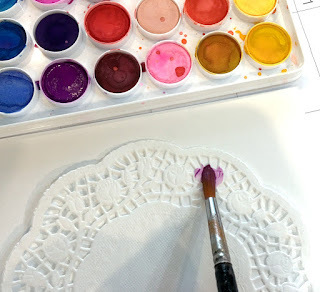 I just used paper doilies from the dollar store and inexpensive watercolour paint. Just dab a few colours of paint onto the doily and let dry. It gives such a pretty delicate look, especially if you use lots of water and not too much paint. Reds and pinks and purples work well together, or yellows and oranges, or greens and blue. 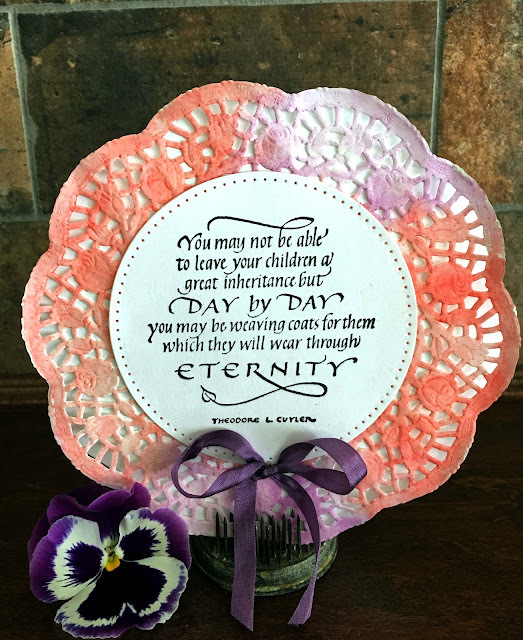 Stamp the quote onto a piece of white cardstock and cut out with an Elizabeth Crafts Designs stitched circle die. 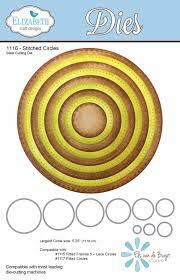 They are the perfect size to fit in the middle of the doily. 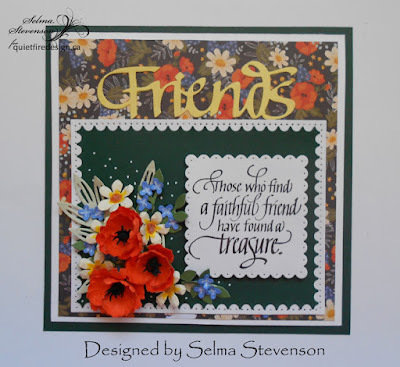 A faithful friend is definitely a treasure! This is Selma Stevenson today. 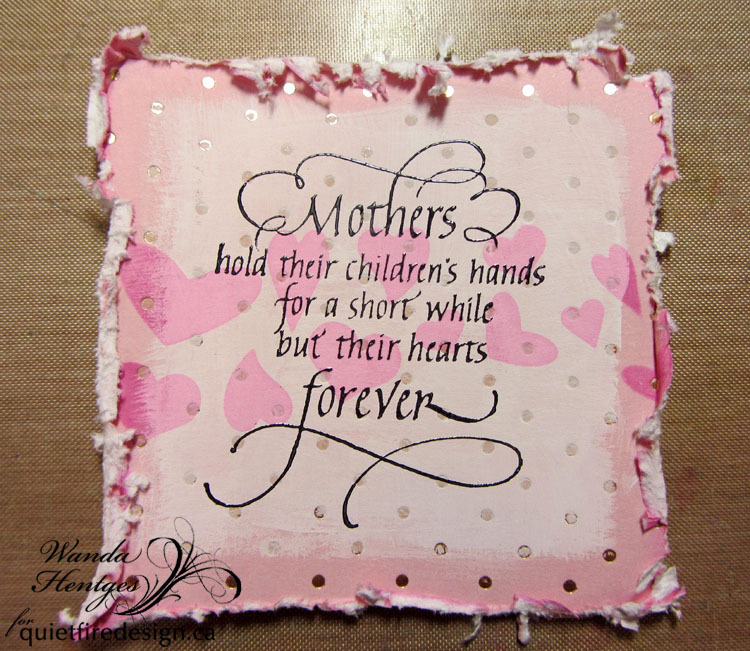 I love this beautiful sentiment combined with the A Way With Words - Friends die cut. I have designed a 6 inch card. A piece of design paper was cut 5 1/2 inches square and attached to a white card. Use the A Way With Words Friends die to die cut one yellow 'Friends'. 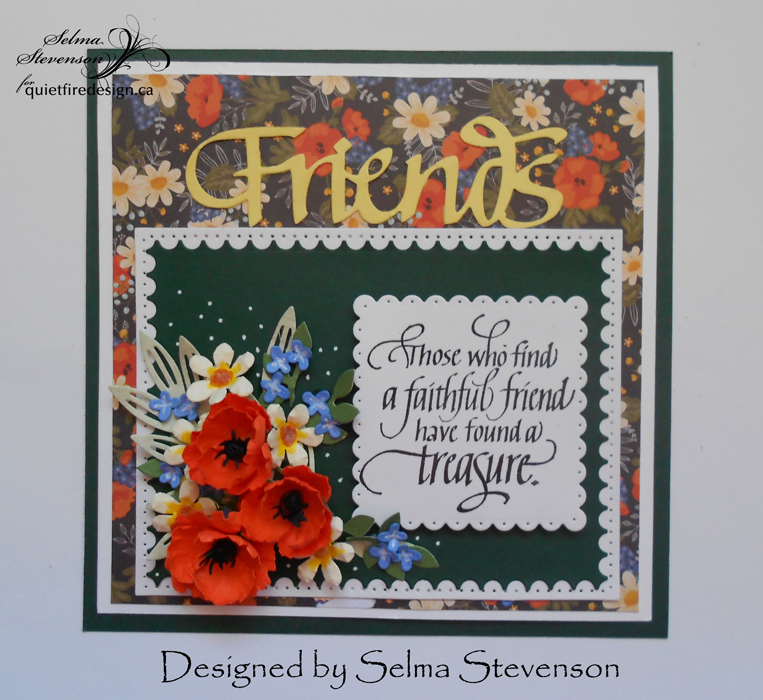 Use the Always Be My Friend stamp set and stamp 'Those who find a faithful friend have found a treasure' onto white card stock using black VersaFine Ink. 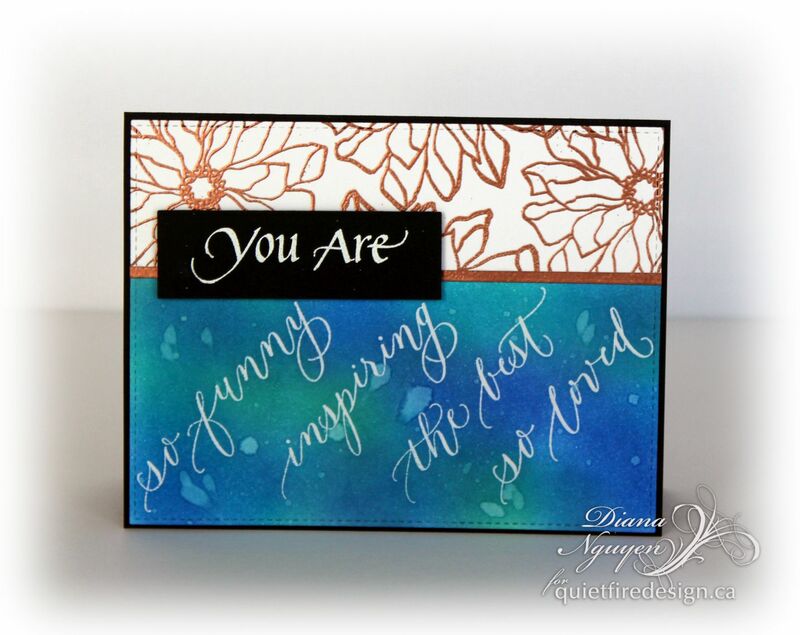 Die cut the stamped sentiment using a Dotted Scallop die. 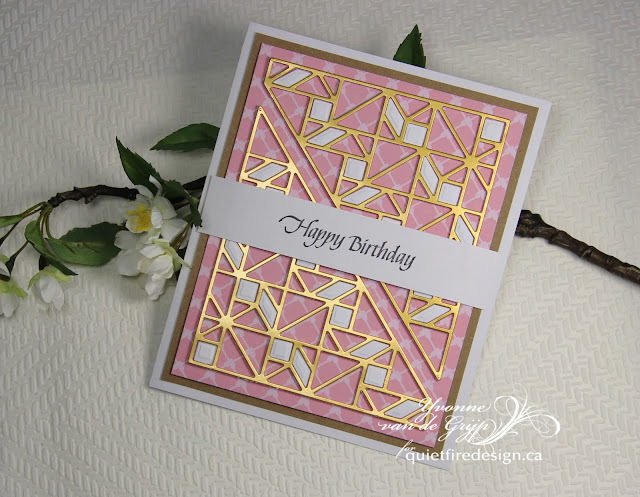 Use rectangle dies to create a frame. 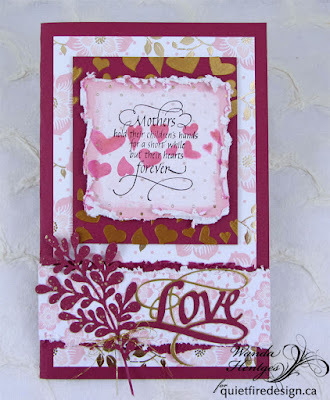 I used the Stitched Rectangles, Dotted Scallop Rectangles and Postage Stamp Rectangle die sets. 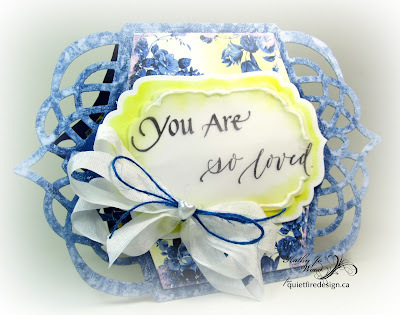 Attach the stamped sentiment square on the right side of this rectangle frame. 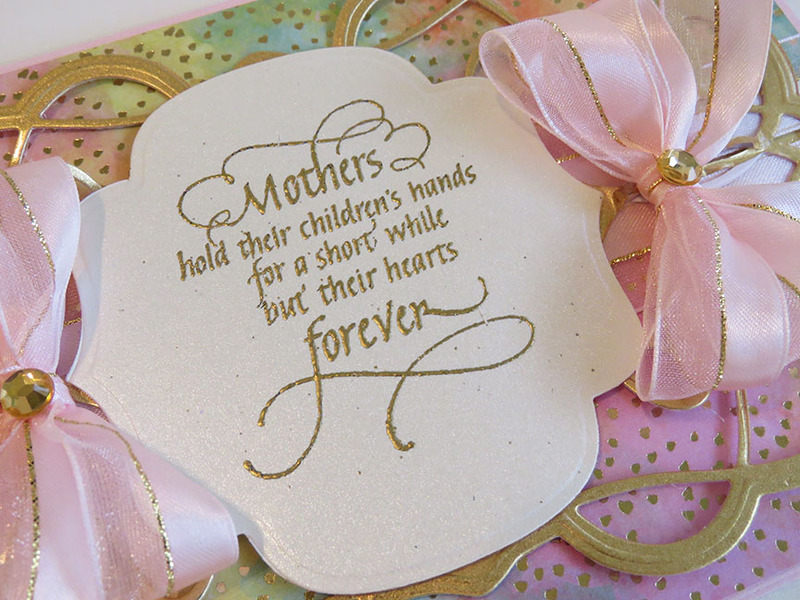 I wanted to duplicate the flowers, in the design paper, to go beside the sentiment. 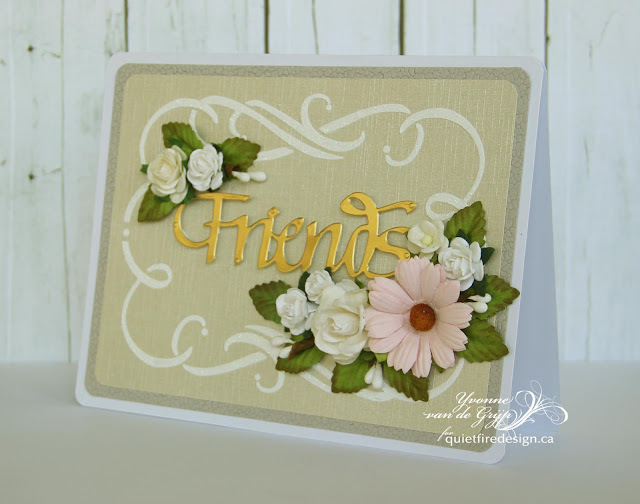 I used Susan's Garden Notes Poppy die set, Garden Notes Lilac die set for the blue flowers ,and Joset Designs Behive die set for the yellow flowers. The leaves were die cut using the ModaScrape Leafy Branch 2 and Leafy Branch 6 die sets. 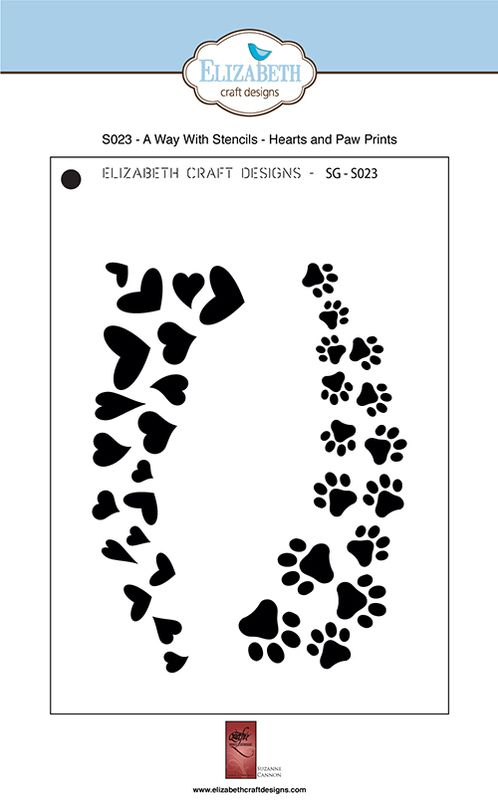 These dies are from Elizabeth Craft Designs. Hello, Diana here with a question for you! So have you ever bought a stamp set and used every single stamp in that set? I actually have a hard time doing that - there's always that one stamp in the set that I must have and others I find I love to use but as much as I hate to admit it, there's usually a stamp in a set that never gets inked. 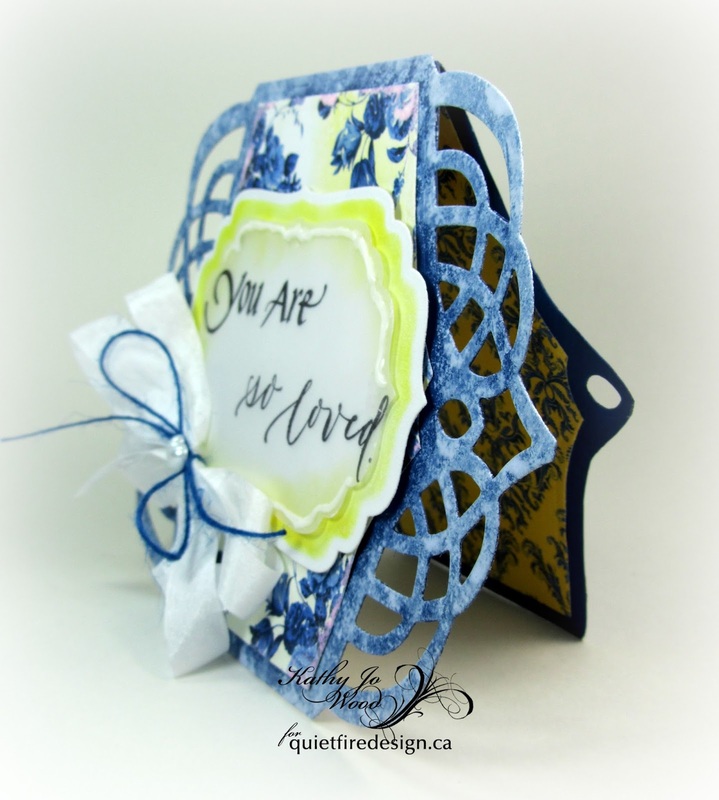 However, I am happy to say that is not the case with this stamp set You are from Quietfire Design. I lined up all of the 4 descriptives and embossed in clear on white card stock. 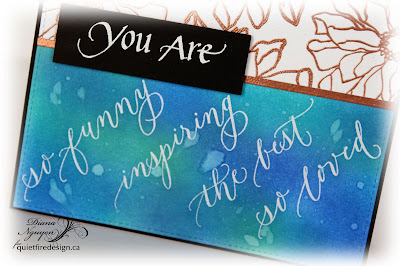 I then used my blue and green Distress Inks and sponged over two third of the card stock to make the lettering pop. The top third is gold embossed with flowers from Elizabeth Craft Designs Flower Power. I then embossed in white on black card stock the "You Are" and popped it up above the background. 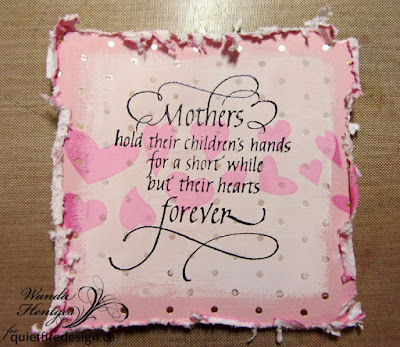 Hi everyone it's Teresa here today to share a quick Mother's Day card that you can whip up with just a few simple papers and one of my favorite stamps called "Mother's Hold their children's hands". 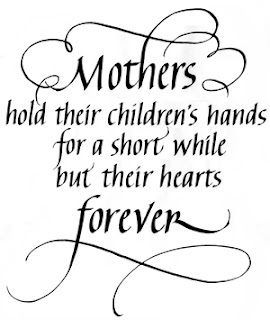 This is such a beautiful saying and would be perfect to give to a special mom or grandmother too. 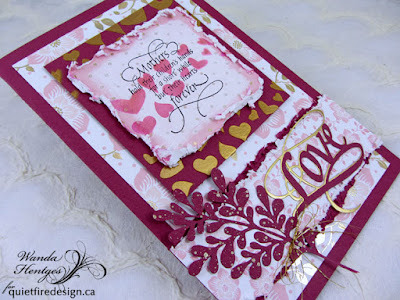 To make this card i used a watercolor paper that i got from Micheal's that had tiny gold flecks in it for my background. 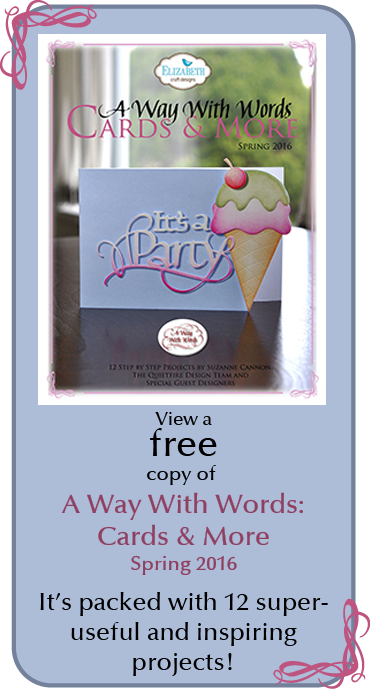 I matted it with a matching pink cardstock and then a shiny ivory cardstock for my card base. 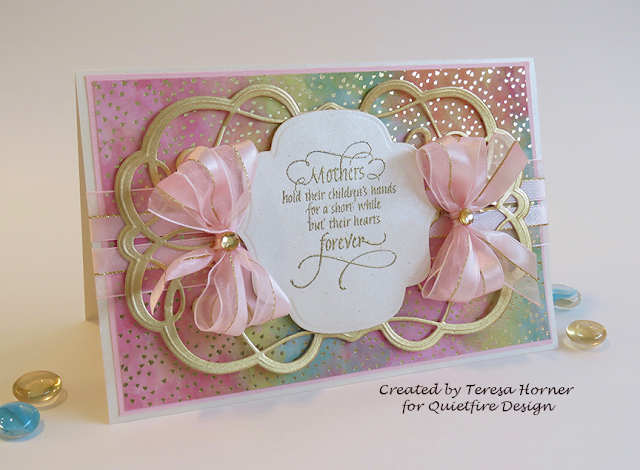 Over that i glued two strips of pink and gold ribbon to the base and then i cut out a gold filigree die from Becca Feeken. This gave the perfect trim to go under my stamped image. I thought that gold embossing would really set it off so i stamped it in black Versafine ink and embossed it with gold powder. 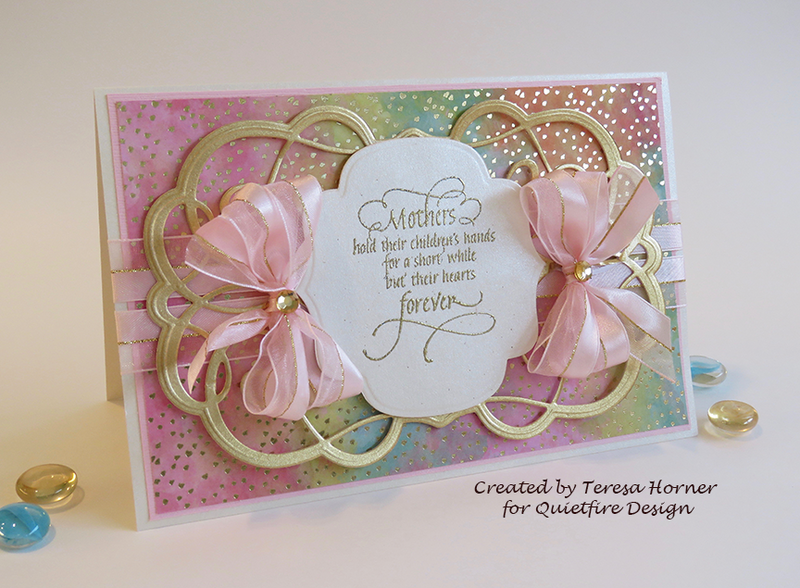 It came out really thin and clear and really made all the gold in the ribbon and backgrounds pop. I hope that you like it. Thank you for stopping by... and have a wonderful crafty weekend. 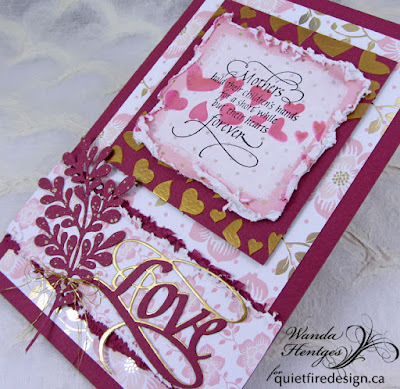 Yvonne here with a new card using a gorgeous Quietfire Design stamp. 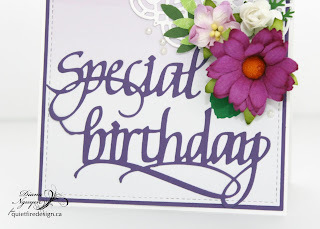 For my card I used the Quietfire Design stampset Happy Birthday Plain and Simple (set of 7 stamps). 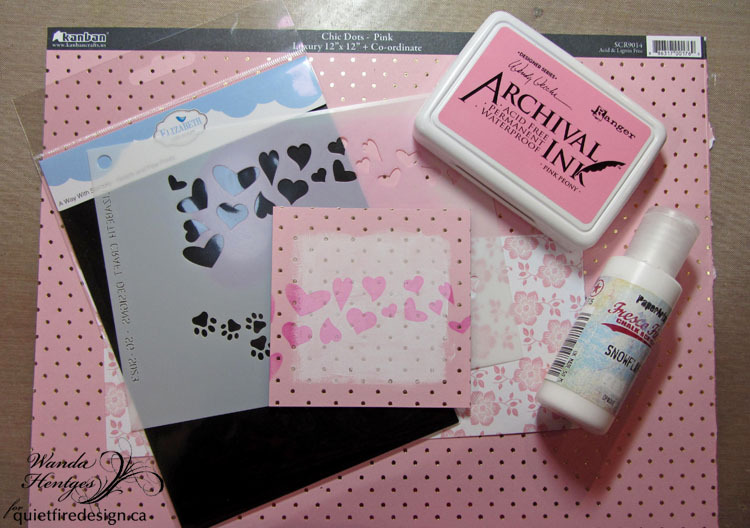 The lovely, versatile stamp set is perfect for cards, scrapbook pages and mixed media art. 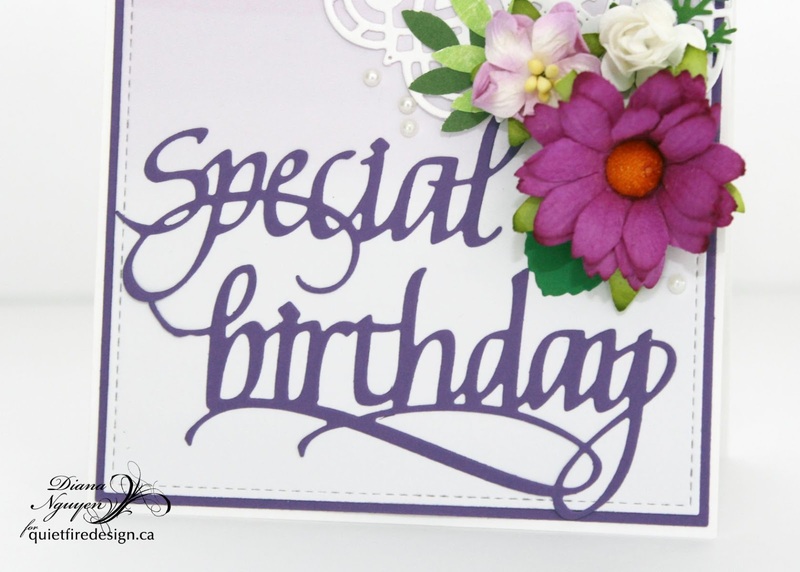 The base of the card was created using Spellbinders die designed by Becca Feeken (Regal Allure). The back side of the card had the flourishes removed. 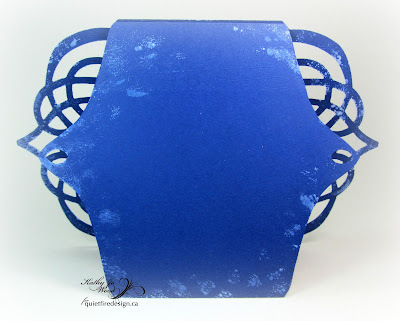 The blue cardstock base had white paint applied along all edges for a shabby look. A triple crinkle ribbon was added to the front for a sweet finish. 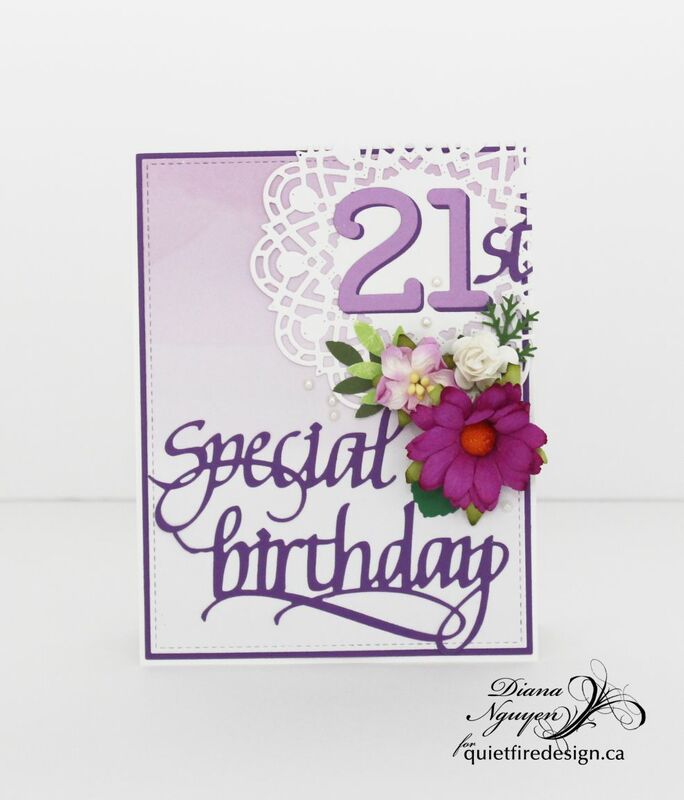 I have a niece who is turning 21 this month so I made this special card for her. The message is made by combining two different Quietfire Design die sets: Special Moments and happy birthday 2. 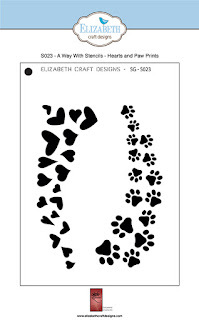 The "21" is from Lawn Fawn but the "st" is surgically cut the Christmas die cut! I didn't want to mix too many "fonts" on the card. 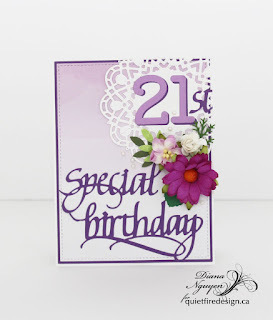 The 21st is anchored on a doily and a cluster of Wild Orchid Flowers complete the card. Purple is hard to photograph but it's one of my favorite colors to work with. 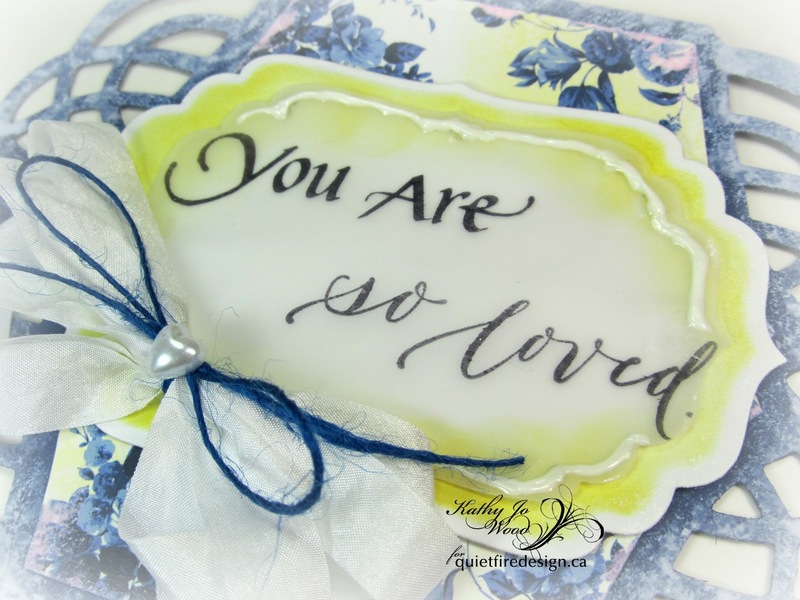 Don't you love the look of the die cut sentiments in combination with a stamped sentiment! This is Selma today and I have combined two A Way With Words die sets along with the Live in the Moment stamp. This is the stamp used on the doily background. 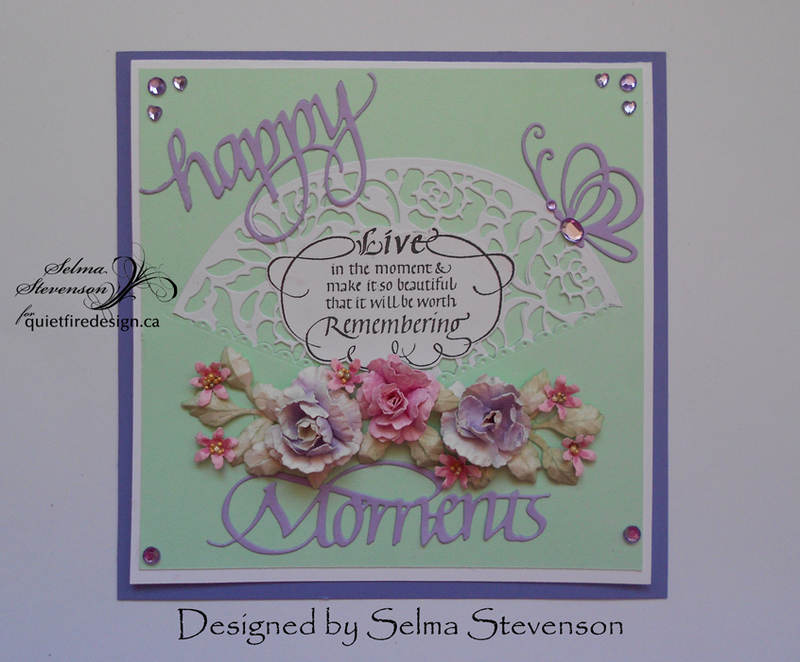 I used the 'happy' from the happy birthday die set and the 'Moments' from the Special Moments die set. These were die cut using lavender card stock. To create this feminine card, I created flowers using Susan's Garden Notes Rose 1 dies. 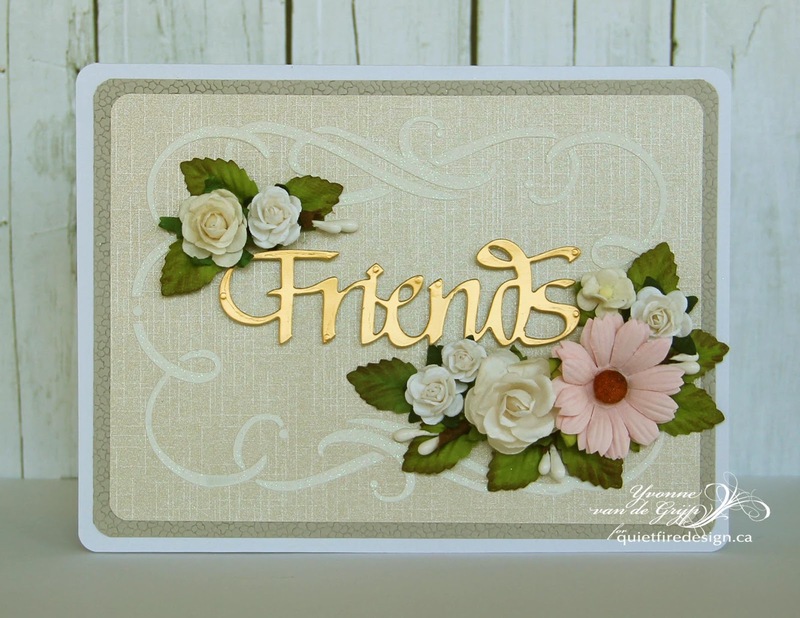 The small flowers are die cut from the CountryScapes Clematis-Ivy Die set. The doily was die cut using the Gatefold Roses die. To cut an opening for the Gatefold Roses die cut, I used the Fishtails Border die set. The doily was tucked down in the opening created in the Fishtail Border opening. 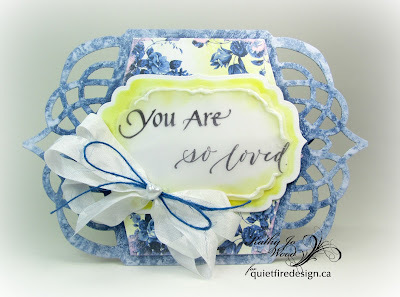 The sentiment was stamped using black VersaFine ink and cut around with scissors and glued to the center of the doily. 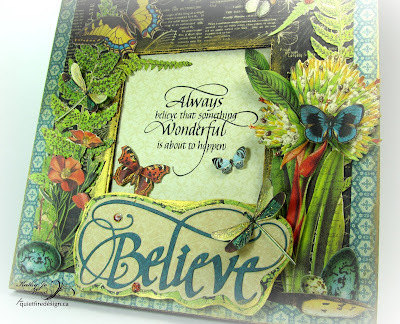 The butterfly was die cut using the Dancing Butterfly die set. All these dies are from Elizabeth Craft Designs. This months theme at the Quietfire Design blog is Friendship. 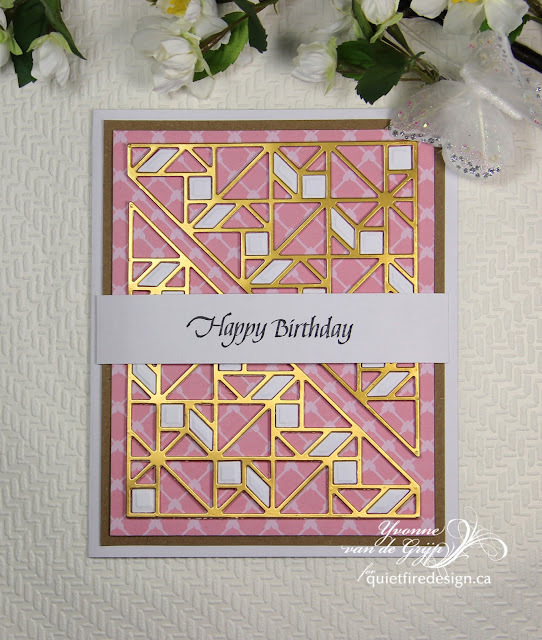 For today's card I used a Quietfire Design cutting die as well as a Quietfire Design stencil. Dor the background I used the stencil with structure paste. 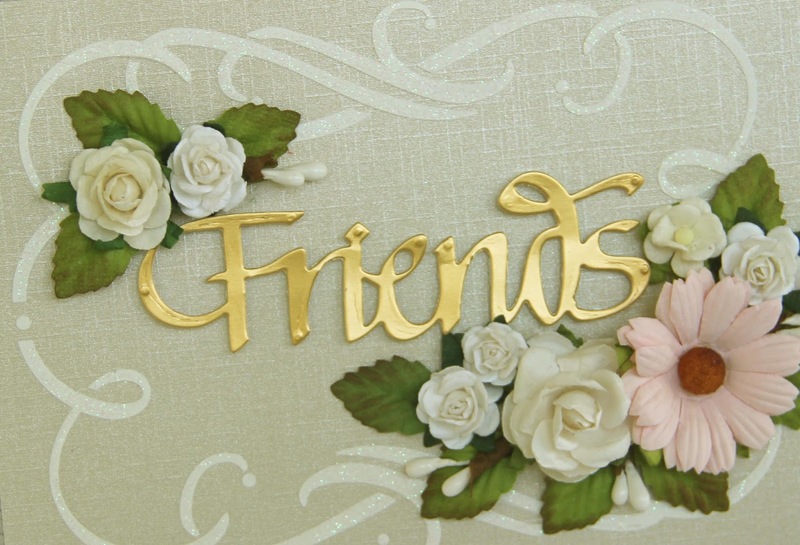 The die-cut is glued upon the card using 3D foam tape. And of course ;-) I used flowers as embellishments. Wishing you a great day and thanks for stopping by! Spring has sprung and, as a gardener, my mind is full of ideas for the gardens. Last week my friends and I started various sunflower seeds. The visions of tall, happy sunflowers in our late summer gardens has been the subject of our excited talks this week. 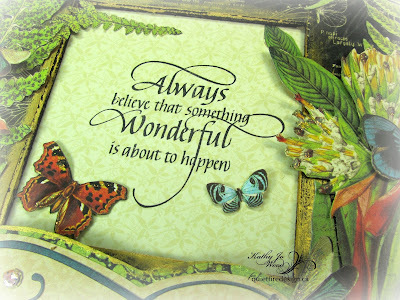 I guess you could say that gardeners always believe- that with our pleasurable work- something wonderful is about to happen. With gardens on my mind, I upcycled a frame using Quietfire Designs' "Always Believe" stamp and "Believe" die. Jet Black Archival Ink was used on Graphic 45's Nature Sketchbook ivory paper. (Nature Sketchbook was used entirely as the papers for this project.) 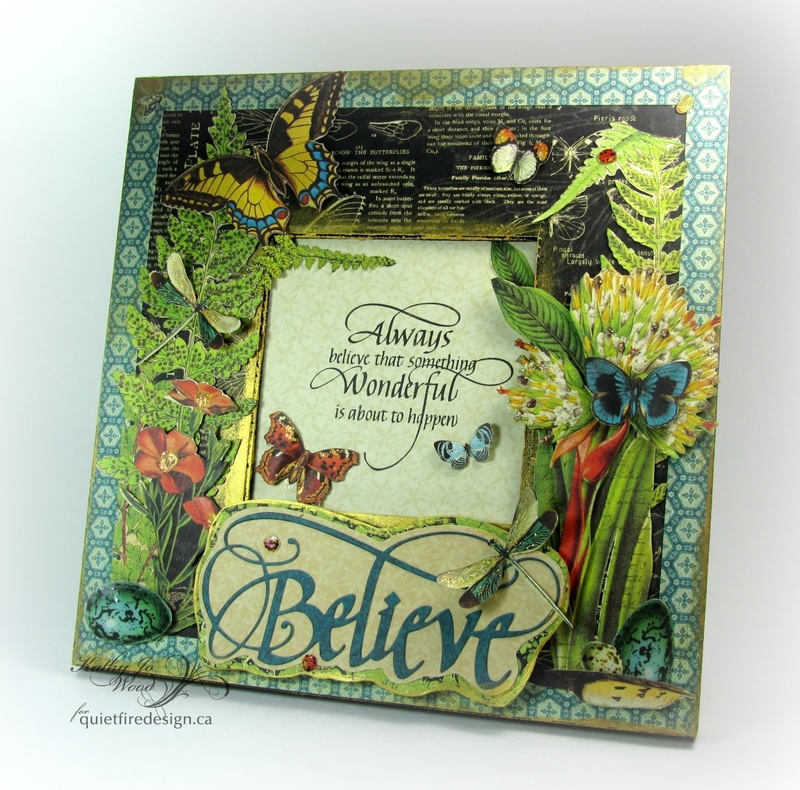 Sweet butterflies and lush foliage create a natural frame around the beautiful stamp. 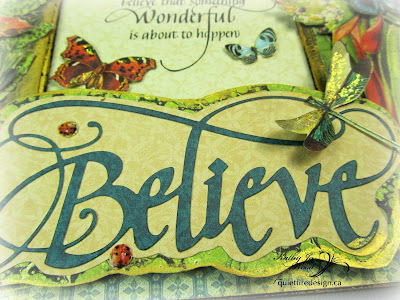 Believe was die cut and mounted on two layers of papers. 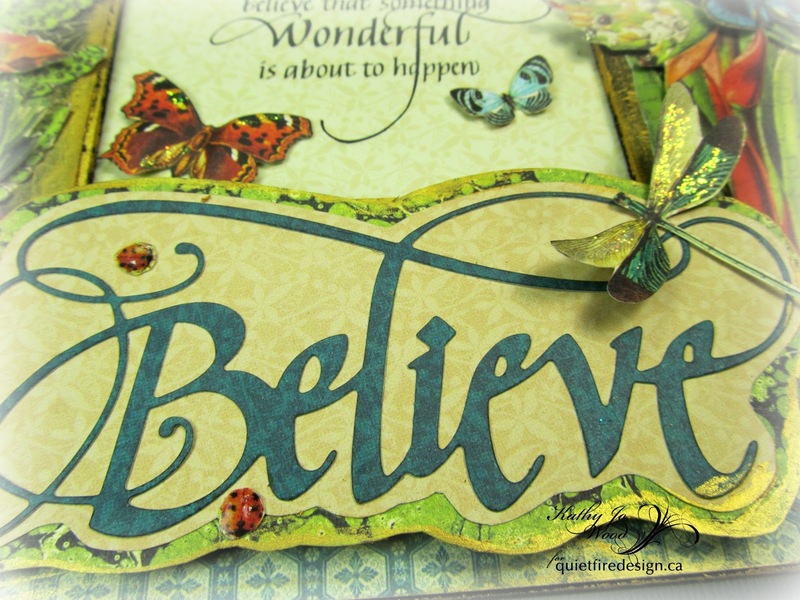 Lady bugs and a dragonfly grace the lovely die cut. After hours of fussy cutting, mounting with foam tape and adding Stickles or clear enamel, my dreamlike garden wall art was complete. Seeing the frame on my wall makes me smile with thoughts- and belief- that the gardens will lush and beautiful with life. Hi There!!! It's Wanda here today. I hope this post finds you well!! In the US Mother's Day is only a bit more than a month away which means there is time to get one (or more) of Suzanne's gorgeous Mom stamps and make some cards. 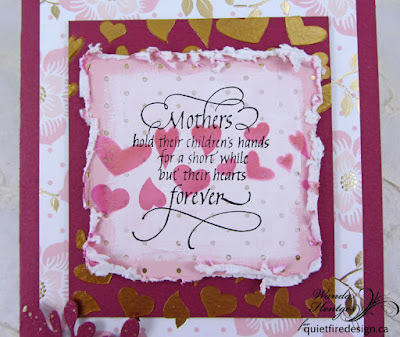 Today I've combined the Mother's Hold Their Children's Hands stamp with the Hearts and Paw Prints Sprays Stencil and the Love Cutting Die to make a beautiful card. I've also used the gorgeous Kanban paper set - Shabby Chic Dots - Pink. 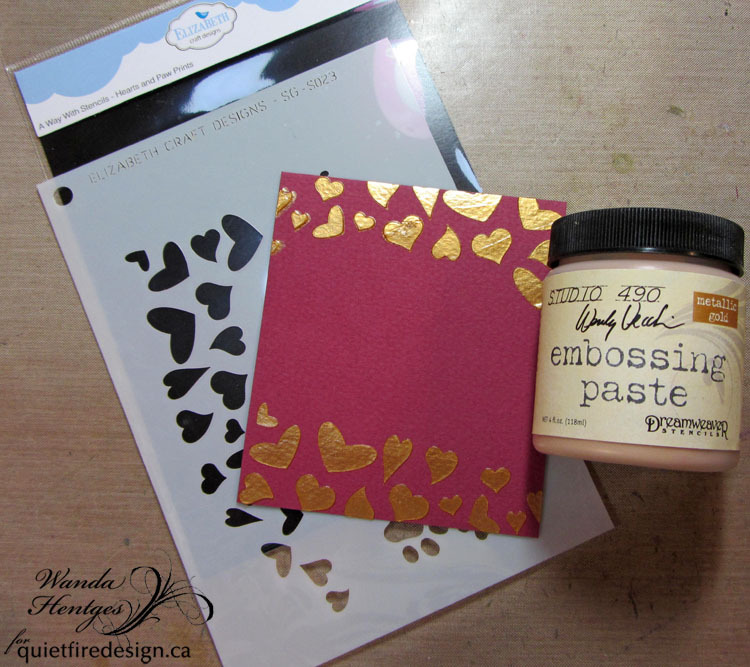 and then stamping the quote in black and embossing it with clear powder. I also heavily distressed the edges using a Distrezz-It-All. 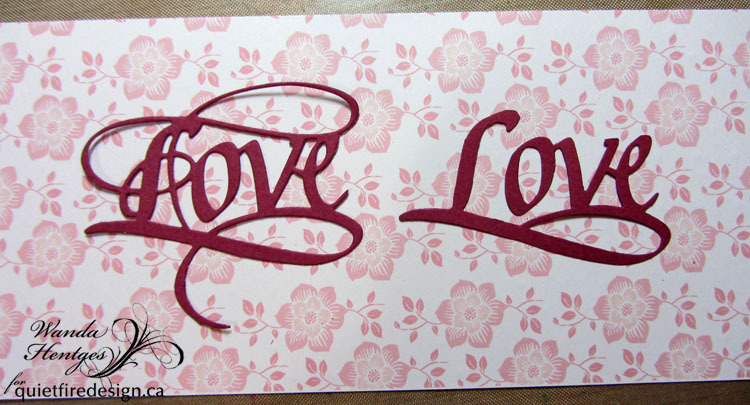 Later, after choosing a color of plain cardstock, I stenciled over the hearts more with a couple more colors of Archival Ink to help them match a bit better. 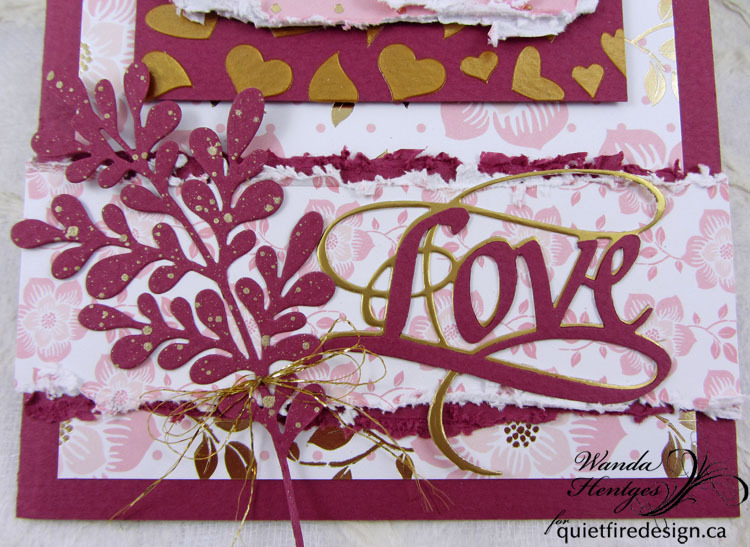 I die cut Love from the plain cardstock - decided that shorter (from top to bottom) would be better for what I thought I was doing - and carefully cut off some of the flourishes. Gold embossing paste through the Hearts Spray is beautiful!! 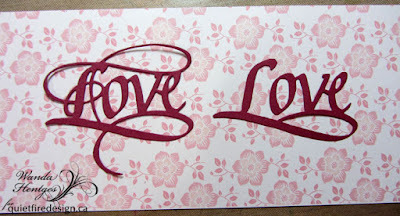 My original plan was for the strip of patterned paper with the strip of plain cardstock across the bottom and just the word love in the center. Then I thought it needed more and decided to also cut a Love form gold paper. I was going to trim it to match the trimmed cardstock Love but liked the extra gold flourishes so left them. Lastly I cut the Elizabeth Craft Designs, ModaScrap, Leafy Branch 5 from the same plain cardstock, splattered it with gold paint, and added fine gold thread like a bow. I had meant to distress the edges of the bottom printed paper with the larger flowers but got carried away and glued it down before that happened. Oh, well, it still worked out fine. I hope you've enjoyed today's card!!! If you have a moment, I'd love to hear what you think in a comment.